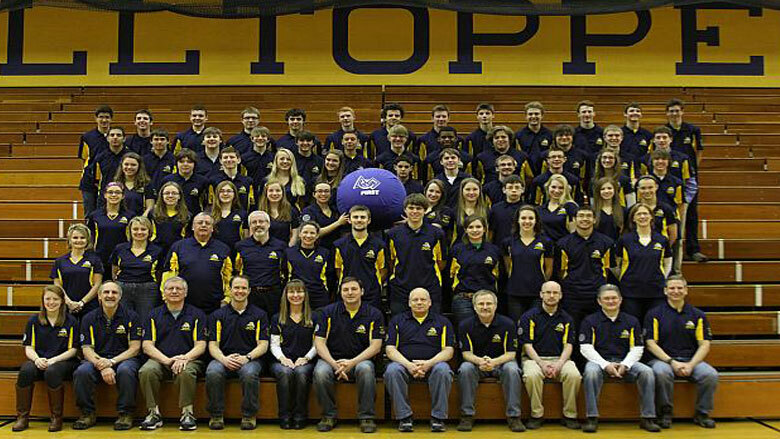 FRC Team 1732 Hilltopper Robotics is a FIRST Robotics team comprised of Marquette University High School (MUHS) and Divine Savior Holy Angels High School (DSHA) students. Imagine what we might see if only we could build a warp field—a bend in the fabric of space-time—that would allow us to peer into the future. Might we see what we will have accomplished, and thereby bring back the knowledge gained from those accomplishments? What would you say if I told you that even as you read this article students are creating a kind of warp field that offers them a glimpse of their future selves and accomplishments? This is the nature of a FIRST Robotics regional tournament, like the one held at the Cellular Arena in downtown Milwaukee each spring and in cities around the country—and, in some cases, around the world. Founded in 1989, For Inspiration and Recognition of Science and Technology (FIRST) is a nonprofit, international youth organization that operates the FIRST Robotics Competition as well as FIRST LEGO League, Junior FIRST LEGO League, and FIRST Tech Challenge competitions. The mission of FIRST is to show students of every age that science, technology, and problem-solving are not only fun and rewarding, but are proven paths to successful careers and a bright future for us all. Indulge me for a moment and try to visualize the groups of high school students swarm lazily around in the pit area at the back half of the sports arena floor during the morning hours of the recent FIRST Robotics regional tournament in Milwaukee. Their varied elliptical orbits take them to and from their portable work booths to run tests and maintenance on their robots. And these are large, complex robots—the real thing, all rivets and welds, pneumatics and electronics with gears and belts and appendages of all different sizes and shapes. Look closer at the frenzied pace of midday competition in full swing and try to keep up as whole groups of students pull their team robots into the orbit that now includes the rollicking competition floor in the front half of the arena. A team brings their robot to the game field and a cheer erupts from the stands. Soon, another team and another uproarious cheer. Controlled by their respective teams, the robots compete in head-to-head games on the floor (and on the JumboTron screen). In this year’s game, robots of different sizes and shapes pass giant exercise balls to each other and over barriers while other robots try to prevent them from doing so and pass their own balls down field to score, all while the crowd sings along to campy classics like Neil Diamond’s “Sweet Caroline”—bum, bum, bah—and “YMCA” by the Village People, pantomiming the now-famous dance moves. Sprinkled through the crowd are groups of bouncing students in various levels of costuming to show their support for the STEMpunks, the Robo Chickens, or any of the other sixty or so teams. During breaks in the competition, long lines of team mascots do the Macarena. The competition, randomly assigned three-on-three matches to see which teams will go home with the trophy as the Wisconsin Regional Champions, goes on for two-plus days (almost three if you include practice on Thursday). After awards are given out late Saturday afternoon, and wins and losses are absorbed, the thrum and vibration begin to dissipate. Students and mentors begin to break down their work booths and load up for trips back home (home for some being across town and for others across the country). This is just a glimpse of what goes on at a FIRST Robotics competition. Powered by the work of 130,000 volunteers and 3,500 sponsors, FIRST Robotics hosts competitions like this across the globe, from Hawaii to Israel and from Mexico City to the Netherlands, fielding teams from kindergarten on up, including 2,720 high school teams. It’s worth noting that there are a number of young women who participate—and have participated—in FIRST Robotics, many of whom go on to become leaders in fields like science and robotics. For these young women, FIRST Robotics is encouraging more and deeper participation in what are commonly known as STEM areas—science, technology, engineering, and math. And this is a good thing, given the prevailing gender gap in these areas. For instance, a 2011 US Department of Commerce report, Women in STEM: A Gender Gap to Innovation, revealed that women represent a mere 24% of the current STEM workforce. According to the report, men are much more likely than women to have a STEM job regardless of educational attainment: one out of four math and computer jobs is held by a woman, while one out of seven engineers is a woman. Recent news headlines—“STEM Fields and the Gender Gap: Where are the Women?” (Forbes, June 2012), and “Why Are there Still So Few Women in Science?” (New York Times, October 2013)—underscore the trend of low participation by women in STEM fields. What are the reasons behind this low participation? More importantly, how can we help girls to succeed—and lead—in STEM-related fields? Peer again into the warp field and I will show you how FIRST Robotics volunteers, mentors, and students are all creating a brighter future for women in STEM. Amber Gell is a hometown girl from Franklin, Wisconsin, with a successful career as a NASA rocket scientist. Gell has flown home each spring for the last six years to serve as a judge for Wisconsin’s FIRST Regional Tournament, and she seemed delighted for any excuse to talk about FIRST Robotics. While Franklin High School didn’t have a robotics team when she was there, Gell says she really wishes they had because she would have been better positioned for success earlier in her career. Today Gell works for Lockheed Martin as a spacecraft systems engineer for Orion’s Landing and Recovery Systems team, but she has had to find her own way. The kind of experiences FIRST provides could have propelled her along much more rapidly. Gell points out just how important it is for students to learn how to compete against and also collaborate with other groups. Again, she notes that in many ways this is how it is done in the real world where, for instance, Boeing may be bidding against McDonnell-Douglas on one project and on the next they may be teaming up. Another key element Gell mentions is how FIRST Robotics fills these kids with passion and confidence. She says that it doesn’t matter whether the students are talking to a student from another team or a CEO from a Fortune 500 company (or a NASA rocket scientist), they light up when they start describing what they’ve done and accomplished, how they solved this engineering problem or cleared that programming hurdle. In fact, a five-minute conversation with any of the FIRST Robotics adult volunteers almost always leads to a story or anecdote about a moment when some young person’s future changed direction because of their involvement in the program. For Gell, that young person was a high school senior named Rachel from FIRST Team 1714–More Robotics. Gell describes how Rachel went all fangirl—the somewhat crazed way we picture someone behaving at a boy-band concert—during the Milwaukee tournament, getting Gell’s signature and manically chatting her up. Gell was somewhat surprised when Rachel followed up their conversation with remarkable maturity and confidence a couple weeks later, providing responses to Gell’s questions and outlining her own ideas and goals. About a week after their follow up conversation, Gell heard that Deep Space Systems, a major corporation that works with NASA, was looking for interns over the summer. Gell connected them with her former fangirl and, after several stages of screening, Rachel ended up with an aerospace internship. Not a bad way to spend the summer before heading off to college. With the pace of life in the highly competitive aerospace industry, you can imagine that a rocket scientist’s schedule is very tight. But when Gell talks about why she commits three days to judging this competition every year, you can hear the emotion in her voice. Maggie Rossiter Peterman, the Regional Director for FIRST Wisconsin, has been organizing robotics competitions for four years. A newspaper journalist for over thirty years, Peterman first heard about the program and its impact on students—especially girls—while researching a story she was pitching to the Wisconsin State Journal. Peterman was drawn further and further into FIRST by the inexorable pull of the people and their passion for the movement. When the opportunity came along, she made the jump from regional reporter to regional director. Among her myriad responsibilities at FIRST Wisconsin, Peterman helps organize and run the Wisconsin Regional Tournament every year. With around sixty high school robotics teams competing and an annual budget of just over $200,000, the Wisconsin Regional at Cellular Arena is a pretty massive undertaking. But it is important to note that it is only one of 98 FIRST events just like it staged around the country every spring. Peterman always seems to have time to share why she loves this program, adding that she would like to see it keep growing year after year—even if that means even more work for her and the many volunteers. For her, the biggest impact of the program is not necessarily related to STEM at all. Of course, as you might expect, Peterman also has a story about a young woman whom she met and talked with at the national championships in St. Louis this year. The young woman recounted how in her first year of FIRST competition, when she was in 8th grade, her LEGO robotics team came in dead last—which means their robot completed fewer of the small tasks on the competition table than any of the other robots. The defeat tempted her to give up, but she told herself, “Well, we came in last, so we couldn’t possibly do worse next year,” and she decided to stick it out for one more year. Obviously, having made it to the national championships in her senior year of high school means she did more than just “stick it out for one more year,” and the same young woman who “failed” will be attending Worcester Polytechnic Institute in the fall with a full scholarship. She explained to Peterman that when she added up all the scholarships that she was offered at the schools to which she had applied, the total was almost half a million dollars. The last story I want to share with you is my own. It’s a story about Aly from FRC Team 1732—the team for which I am the lead mentor on the non-technical side of things. In addition to being a leader for the mechanical sub-team this past year, Aly Myszewski was our team’s nominee for the prestigious Dean’s List award from FIRST. This award is a recognition of how well a student reflects all that is best about being part of a robotics team—from hands-on engagement with the design and maintenance of the robot to role modeling for younger members of the team and beyond that to their role in community education and outreach. During the tournament, Aly had a chance to share with the judges what it has meant to her to publish scientific research in a medical journal while still only in high school—the results of an elective research project—and how important it is for her to be a role model, the kind of person that she remembers looking up to when she first joined the team. Aly also shared her post-college ambition: to create an organization that develops networks to better connect biomedical engineers, equipment, and resources in underdeveloped countries in the effort to support and save human lives. At the end of the tournament, Aly’s team was one of the three members of the winning alliance (robots compete in three-on-three matches, and each group—consisting of robots from three different high-school teams—is called an alliance). But when the awards were given out, Aly was not called to the stage as the winner of the Dean’s List award. For a young woman with a list of accomplishments like hers to not win says a lot about the caliber of current and future leaders that FIRST produces year after year. These are memories she will take with her as she heads off this fall to Boston University, having received an impressive scholarship package, to pursue her passions for medicine and biomedical engineering. Like many of our team alumni, Aly will probably be here at the regional again next year, taking a break from college, cheering at the top of her lungs for the students following in her footsteps. A glimpse into the experiences of these women tells us what stories of resilience and inspiration the thousands of other people who participate in this “varsity sport of the mind” might share. Anything that we can do, that you can do, to cultivate and nurture STEM opportunities like FIRST Robotics, helps to make sure that these glimpses of the future become the norm and that these young people—especially young women—step into positions that allow them to then push the next generation and their future even further. Erik Richardson lives in Milwaukee, where he works as a development director for the arts, small business consultant, and adjunct professor in several disciplines. His work has appeared in a variety of publications, from magazines to poetry to nonfiction books on math and history.